An interesting field highlighting three interacting galaxies in the constellation of Pavo 190 million light years away. 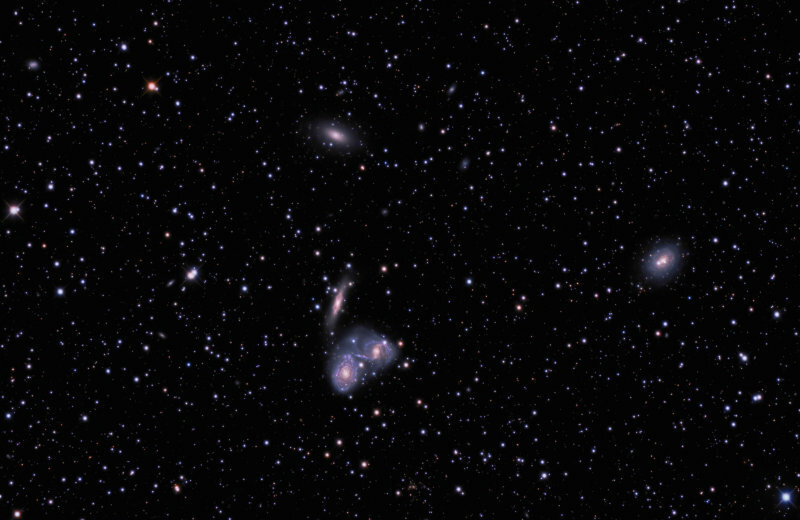 The tight group of three galaxies below centre frame comprises NGC 6769 (at the 6 o'clock position in the group), NGC 6770 (at the 3 o'clock position) and NGC 6771 (at the 11 o'clock position). The other two bright galaxies are IC 4842 (top of frame) and IC 4845 (at right of frame). There are also many other faint galaxies in the field worth a closer look. Courtesy www.eso.org: It is obvious that stars and gas have been stripped off NGC 6769 and NGC 6770 are starting to form a common envelope around them, in the shape of a Devil's Mask. There is also a tenuous bridge of stars between NGC 6769 and NGC 6771. All of these features testify to strong gravitational interaction between the three galaxies. The warped appearance of the dust lane in NGC 6771 might also be interpreted as more evidence of interactions. Moreover, NGC 6769 and NGC 6770 are receding from us at a similar velocity of about 3800 km/s - a redshift just over 0.01 - while that of NGC 6771 is slightly larger, 4200 km/s. This is an 11.5 hour (L+Ls)RGB exposure ((330+90), 90, 90, 90 minutes) using 15 minute subs binned 1x1. FOV 32.8 x 25.2 arc minutes @ 0.59 arc second/pixel.